Concrete lifting foam is used to level, raise or lift concrete. It is a procedure that works to correct uneven concrete by affecting the soil beneath it. Since the early 1900’s slab jacking or mud jacking has been utilized as a means to repair and lift a concrete slabs. This is done by pumping “grout” through the concrete which pushes it up from below. This grout can be made from crushed limestone, water and cement. Cracks in your concrete or a difference in height between where your concrete use to be and where it is now are a few of the indications that your concrete is sinking. Your home may be new, it may even be less than 10 years old but the concrete around your home is showing signs that it is sinking (the driveway or steps are falling away from the house.) You’d like to blame the contractor, but it is not their fault. Concrete that is sinking or cracking may due to the fact that the soil underneath the concrete slab (driveway, sidewalk, patio or deck) has consolidated or soil conditions are drier than they once were or the drainage system around your house is adding to the problem of sinking concrete. A more modern approach to concrete leveling is through the use of expanding polyurethane foam that provides a wide range of benefits that traditional mud jacking techniques lack. clean and test their equipment. And they test the foam for weather conditions. Foam leveling is a two part polymer process that uses a gun type piece of equipment to inject the foam through 5/8” holes. The equipment must always be checked to make sure the PSI and the rate at which the parts are combining to create the injection process (that creates the expansion of the air bubbles) is working properly and effectively. The weather, humidity and weight of the foam (available in 3-8 pound lots) and experience can also affect the success of the foams ability to expand, raise the concrete and cure in differing conditions. Only someone with a lot of experience working with polyurethane foam can work with it in various conditions successfully. Only an expert who consistently works with Foam Lifting as the process in which to repair a sunken concrete slab, will do it precisely and effectively every time. When these pre-check systems are put in place it results in a job that does not have to be re-done (i.e. concrete sinks again as many traditional mud jacking jobs do). Foam lifting with polyurethane is impervious to moisture, erosion or settling. Cured foam retains its shape and volume which greatly reduces the chances of a new void (unless there is an earthquake or other outside cause) forming. Concrete Raising Systems only does one thing: they raise concrete with foam. 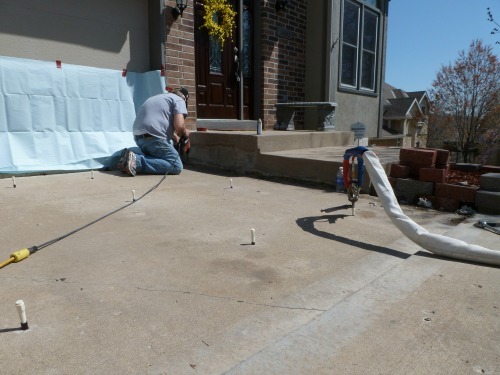 Concrete Raising Systems only uses polyurethane foam to lift, level and raise a concrete driveway, sidewalk, patio or porch. When you only do one thing and you only do it one way, you do it exceptionally well. When considering which approach to take for your cracking or sinking concrete, make sure you get all the information you can to make the best decision for you and your sunken concrete. Choose the best product and the best company with a proven track record for success. Choose Ken and Jason of Concrete Raising Systems of Kansas City. This article was originally posted in August 2013 and has been updated. Great info on foam lifting. It’s amazing that such a light material can be used now to do the job just as effectively. Mud jacking was quite the process. Thanks for the article! I like how you mentioned that concrete raising is a fine-tuned process that requires an expert. My patio has sunken in, and it slants toward the house now which can be a problem when it rains. Maybe it would be a good idea to have a professional come and lift the concrete so we don’t have to worry about tearing it out and replacing the entire thing. It’s interesting that using foam in concrete leveling requires the foam to be pumped beneath the concrete at a certain rate to ensure that it works correctly. I would imagine that the foam wouldn’t be able to push the concrete up if it were injected too slowly and it would do too much if it was injected too quickly. Finding that middle zone would probably be where things happen at the perfect rate to get the concrete back to how it should be. You make a good point about there being several factors that could impact the foam raising process. After all, when you’re using foam to level your concrete you’ll want to make sure that it is done as professionally as possible. A part of the means hiring a professional contractor to do the work for you so that they can take care of any factors that might be problematic.